About 2,000 mourners gather at a church in the Texas Hill Country to remember Lady Bird Johnson. The former first lady died Wednesday of natural causes in Austin at the age of 94. Earlier, a family spokeswoman says nearly 10,000 visitors streamed past the casket as it lay in repose at the LBJ Library and Museum in Austin, Texas. President Lyndon Johnson and first lady Lady Bird Johnson at a barbecue party on their ranch in Austin, Texas, in December 1963. 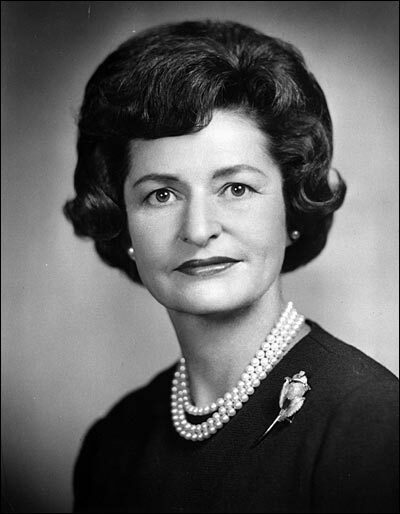 Lady Bird Johnson in 1962. As a child in East Texas, she earned the nickname that would stay with her throughout her life when a nursemaid remarked that she was "as pretty as a lady bird." 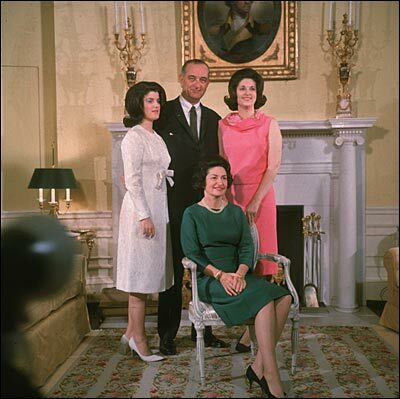 Lyndon and Lady Bird Johnson pose with their daughters, Luci Baines and Lynda Bird, in front of the fireplace at the White House, circa 1966. 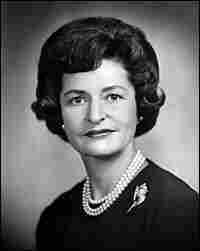 "Lady Bird" Johnson, the wife of former President Lyndon B. Johnson, the nation's 36th president, died Wednesday at the age of 94. Though she rose to prominence as first lady, in the 34 years since her husband's death, Mrs. Johnson earned renown in her own right as a champion of beautifying the outdoors. She lived in Austin, Texas, where she oversaw the Lyndon B. Johnson Library and a wildflower research center in her name. Claudia Alta Taylor was born to a prosperous East Texas family. She earned the nickname that would stay with her throughout her life when a nursemaid remarked that she was "as pretty as a lady bird." 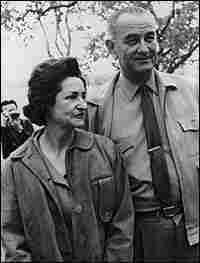 In 1934, after a two-month courtship, she married Lyndon Baines Johnson, then a congressional aide. "In our case, we were better together than we were apart," she said in a 1988 NBC News special. "And I knew that, and I loved my share of life with him." In later years, Mrs. Johnson came to be seen as much more than a gracious hostess and shy first lady. She had a vital influence on the career and temperament of her husband. She was also the financial brains of the family, bankrolling Lyndon Johnson's first run for office and turning an ailing Austin radio station into a financial success. According to friends, Mrs. Johnson used her kindness and graciousness as a counterweight to her husband's outbursts. For example, after Lyndon Johnson's tirade against a young Houston radio reporter named Dan Rather, Mrs. Johnson got in the car and went after Rather, who was walking dejectedly toward the highway. She pulled up beside him and asked him to come back and have some punch, explaining, "That's just the way Lyndon sometimes is." Other times, Lady Bird's disapproval could stop Lyndon Johnson right in his tracks, according to family friend and Austin radio personality Cactus Pryor. "I always thought perhaps the most important words spoken in the White House were Lady Bird saying, 'Now Lyndon, now Lyndon,'" Pryor said. Throughout her marriage, she remained fiercely devoted to her husband, despite his extra-marital affairs. She was troubled to see how he was tormented by the country's divisions over civil rights and the Vietnam War. "The sties are coming back on Lyndon's eyes, first one and then the other, red and swollen and painful. I thought wryly that his life sounded more and more like the tribulations of Job. Nonetheless, he is remaining calm, even-tempered, serenely philosophic about politics. But about the war itself, he is deeply worried." At the time of the historic 1964 Civil Rights Act, Mrs. Johnson went on a four-day train trip through eight Southern states, campaigning for her husband at a time when race relations were boiling — the first solo whistle-stop tour of a first lady in history. She showed a political skill and tenacity of purpose that prompted one writer to call those four days "the most courageous of her public life." Lyndon Johnson retired from politics in 1969 under the pall of Vietnam. After his death in 1973, she lived to see him receive belated praise for his Great Society programs. Lady Bird's unofficial biographer, Jan Jarboe Russell, maintains that history has been kinder to Mrs. Johnson. "She really did stand for the very best in Lyndon B. Johnson: a strong activist commitment to government, a strong record on civil rights, a loyalty to family and country, and her own authenticity, by doing this conservation movement," Russell said. But she will probably best be remembered for her passion for "beautification," a word she always considered prissy. As a girl, she fell in love with wildflowers on her long strolls through the woodlands of deep East Texas, and she brought that affection to the White House. Throughout Washington, D.C., she had millions of azalea bushes, dogwoods, cherry trees, tulips and daffodils planted in public places. And from the bully pulpit of the first lady's office, she pushed for the Highway Beautification Act of 1965, popularly known as "the Lady Bird Act," which sought to eliminate billboards and encourage roadside plantings. "There is a growing feeling abroad in this land today that ugliness has been allowed too long, that it is time to say 'enough' and to act," she said at the time. In 1982, she founded a wildflower research center in Austin, which, on her 85th birthday, was renamed the Lady Bird Johnson Wildflower Center. It serves as a showplace for native plants and as an education center. "I want Texas to look like Texas, and Vermont to look like Vermont," she once said. "I just hate to see the land homogenized." The Wildflower Center's current director, Bob Bruenig, says Lady Bird had a tremendous influence across the country, as other states have planted roadside wildflowers. "She felt that, to have a good life, you had to have a strong connection to the land. And I think it distressed her to see our country diminished because of ugly housing developments, ugly urbanization and strip malls," Bruenig said. "It became her passion to awaken people to the natural beauty of our world." Those who encountered her around Austin say Lady Bird possessed a natural beauty, says biographer Russell. "Everyone has a story about having met Mrs. Johnson on a speech or in the grocery store or in a nursery, and she was always down to earth," Russell said. "So she was one of those rare public people who managed to hold on to her private self." 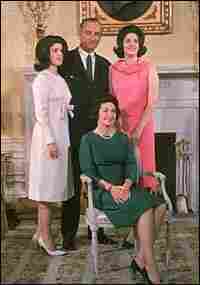 In her later years, which she called her "harvest years," Lady Bird Johnson spent time enjoying the large extended family of her two daughters, Lynda Robb and Luci Baines Johnson. The former first lady also lent support to favorite Democratic candidates. Although legally blind in her later years, she never stopped appreciating the natural beauty of the land. Friends remember how she would have her driver stop the car so that she could get out and admire — even dimly — a brilliant field of wildflowers.